Hailed by Salman Rushdie as a “brilliantly innovative thriller-writer,” Philip Kerr is the creator of taut, gripping, noir-tinged mysteries set in Nazi-era Berlin that are nothing short of spellbinding. 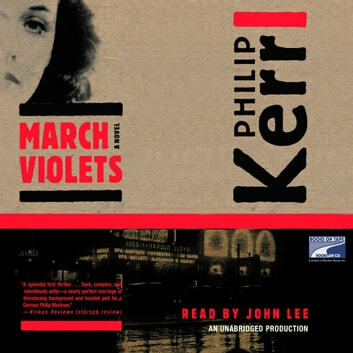 The first book of the Berlin Noir trilogy, MARCH VIOLETS introduces listeners to Bernie Gunther, an ex-policeman who thought he’d seen everything on the streets of 1930s Berlin–until he turned freelance and each case he tackled sucked him further into the grisly excesses of Nazi subculture. Hard-hitting, fast-paced, and richly detailed, MARCH VIOLETS is noir listening at its best and blackest.